It’s been three weeks since I’ve written a movie review. Life’s been pretty hectic around here. We sold a house and bought a house and now we’re preparing to rent out another house. I was unexpectedly laid off, and we had to redo our mortgage financing in a mad, frustrating flurry of paperwork. We’ve relocated ourselves and our six pets and tried to adjust to our new surroundings. This morning I dropped Carrie off at the airport because she’s out of town on business, and then there was a frenzied dash of nervous activity as I tried to get her the cell phone she accidentally left behind. And THEN I had to start my first day at my new job, which is neither a great job nor a terrible job and I have a lot of mixed feelings about it. It’s been a long month, and a long day. All I wanted to do when I got home was chill out with a movie. When I finally got around to that (I had to catch up with the internet first, priorities you know) I turned out all the lights and popped in the new Blu-Ray of this fantastic noir. 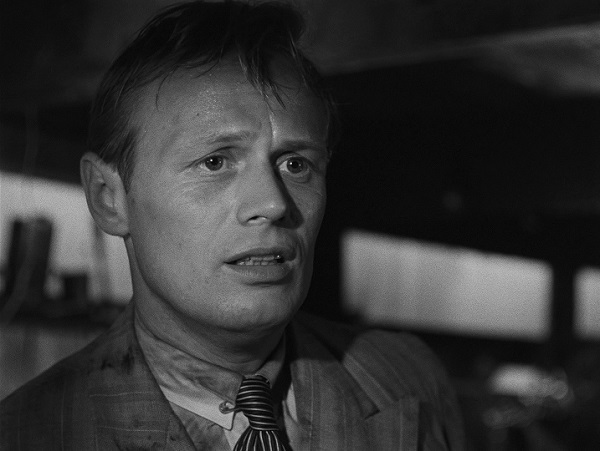 It’s been about five years since I last saw it, but it had really stuck with me, largely because of Richard Widmark’s indelible performance. Harry Fabian is unforgettable because of his sheer will to make something out of nothing. He truly has nothing but ideas, he’s a dreamer who dreams big. But he’s like a cancer, everything he touches turns to hell. In the end, pretty much no one has what they want. What is it about Fabian that poisons the well? Is he any less honorable or scrupulous than the underworld figures he deals with? I think not, but the problem with Fabian is that he’s too hungry. It makes him impatient, and the only way he knows to success is a shortcut. Heavies like Nosseross and Kristo have clearly clawed their way to the top of the heap, they’ve got the faces and the swagger to show that they’ve earned what they’ve got. Maybe the way they earned it wasn’t exactly fair and/or square, but they put the work and the time in. Fabian tries to weasel his way up, and not only does he pay the price, but his reckless fast track leaves a lot of collateral damage behind him. In the end, even his idea of a noble sacrifice looks like a bull in a china shop. Which just leaves a lot of shattered pottery and a severely lacerated bull. This entry was posted on September 14, 2015 at 10:49 pm	and is filed under Movie Reviews. You can follow any responses to this entry through the RSS 2.0 feed. You can leave a response, or trackback from your own site.